Info: The Smith Morey driveshed is constructed in a Saltbox style with an open front. It is one story with a small overhead crawl space. The most interesting feature of the shed is the privy attached to the rear. Abner Newton built the driveshed on the land he leased from the van Rensselaer family. It was one of several outbuildings on his farm, including the Smith Morey barn. Drivesheds were mainly used for the storage of vehicles. 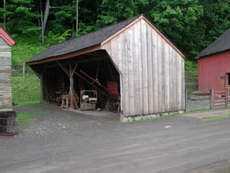 Provenance: The Farmers' Museum purchased the drive shed from Marie Hankle, Nassau, NY on March 18, 1999. *Marie Hankle transferred the title of the property (3.09 acres) to herself on August 27, 1993 when East Nassau officially incorporated itself. Her property was no longer deeded in the Town of Nassau but instead in the Village of E. Nassau. *Marie Hankle purchased the property (4.13 acres) from Smith and Leah Coonradt on October 17, 1977. *Smith and Leah Coonradt bought the property (110 acres) from Leon C. and Ella M. Daniels on October 15, 1942. *Leon and Ella Daniels bought the property (110 acres) from George M. Isaac on September 16, 1939 for $2000. *Floyd Terry bought the same 110 acres from Leon C. and Ella M. Daniels on July 15, 1930. *Leon C. Daniels bought the same 110 acres from Susan J. Coonradt on June 14, 1920. *Susan J. Coonradt acquired 40 acres from Stephen E. Coonradt on May 7, 1888. *A previous deed listing states that there is a deed from J. S. Harris to S. E. Coonradt in B177 P532 presumably at the Rensselaer County records office. *It is believed that Smith Morey purchased the barn and driveshed (1840-1850) and moves them to the location they were in 1999. *In 1790, Abner Newton signed a lease of indenture with Stephen van Rensselaer III and built the barn and driveshed.